I decided for this ingredient challenge where you have to use capers, anchovies and garlic that I would take the first recipe on the pile on my desk and list some of the ingredients. All you need to do is come up with a dish using these three ingredients, plus more if you want to, and blog about it. Post a comment here to let me know that you have done so, and link back to my blog if you do the challenge. Remember this is the last week to compete for this awesome prize. Cindy has made a cake with butter beans! This is for the something sweet with spices challenge. Sue has added her contribution for the something savoury with sweet challenge by sharing a chicken dish with us. Zabwan has shared with us a baked pork sausage dish. Cindy too has cooked with pork, but she chose fillet. 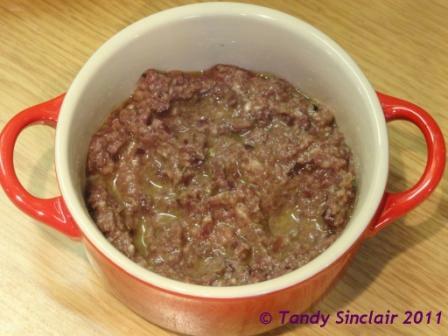 Mitzi is first timer on the weekly challenge front, and she has done a Nigel Slater recipe. Thank you to all of you for taking part in my challenges. watch out for the recipes! Sigh, I love anchovies but always find they are SO expensive! Do you have any secret spots that sell it cheaply? I only ever get from Woolworths – and I have no idea how much they cost as I never look! Sorry that I won’t be taking part in this challenge – such a pity with such great flavours. I would probably have made a pizza with a thin crispy crust. you can still do this when you get home YAY!